Nestled in sand dunes on the beach at Mawgan Porth. 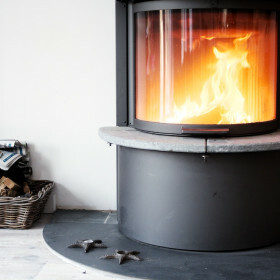 Log burner. Open plan living. 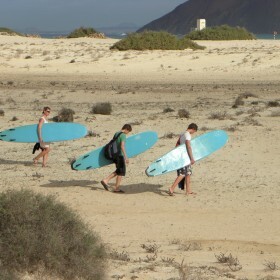 Barefoot walks to a top surfing beach. 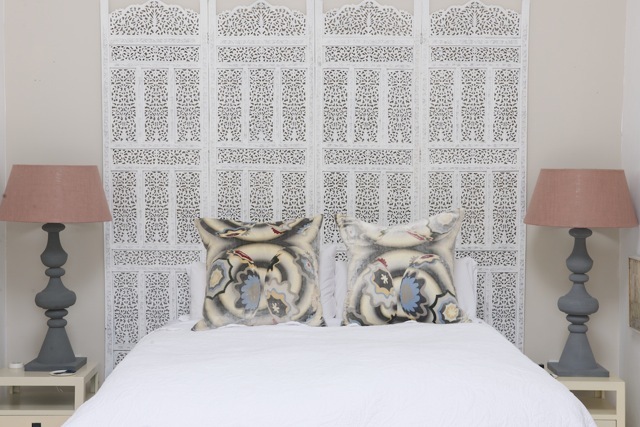 Totally secluded and private, The Dunes offers accommodation for up to six people. 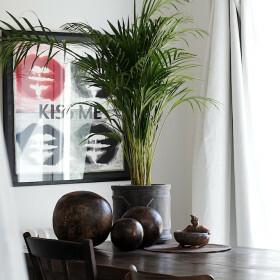 The house is exceptionally spacious, light and airy. 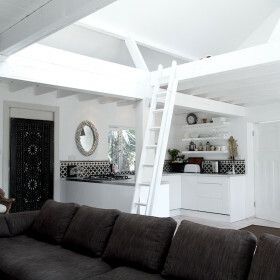 The open plan living area features a log burner, a large L-shaped sofa, flat screen HD TV, DVD and high speed WiFi. The open plan kitchen has a large dining room table, a fully equipped kitchen with an ensuite utility room, which includes a sink, washing machine, dishwasher, extra fridge freezer and a small office area. 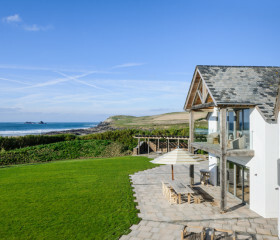 Located a few yards from the beautiful sandy beach of Mawgan Porth, on the North Cornish Coast there are miles of spectacular walks accessed directly from the house. 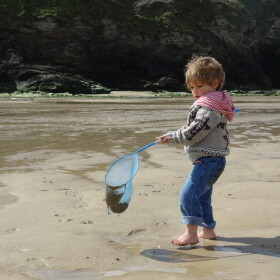 Mawgan Porth itself offers a choice of activities. 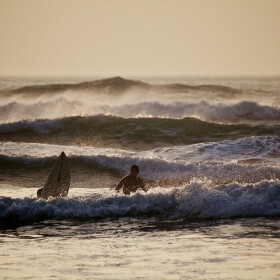 Neighbouring Watergate Bay and its famous surfing beach offers a choice of waters sports and Jamie Oliver’s Fifteen Restaurant. Close by is Padstow, an old Cornish fishing town and home to Rick Stein’s and Paul Ainsworth’s restaurants. 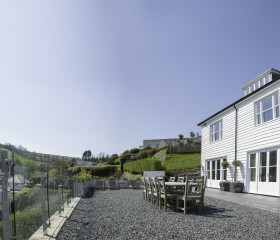 The outdoor space features a roll-top bath tub on the decking, an outdoor shower, a large alfresco dining room table, sun umbrella, chairs, a barbecue and sun loungers. The higher garden area features a look out with sea views, perfect for watching the sunset, and an area for beach style football & volleyball. 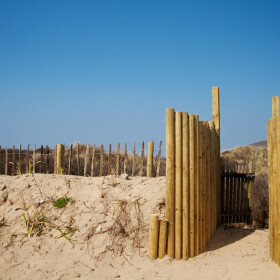 Guests have direct access through a private gated path leading through the sand dunes and onto the beach. 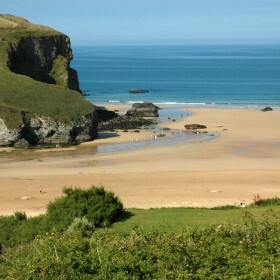 The Dunes is a few yards from the beautiful sandy beach of Mawgan Porth on the North Cornish Coast there are miles of spectacular walks accessed directly from the house. 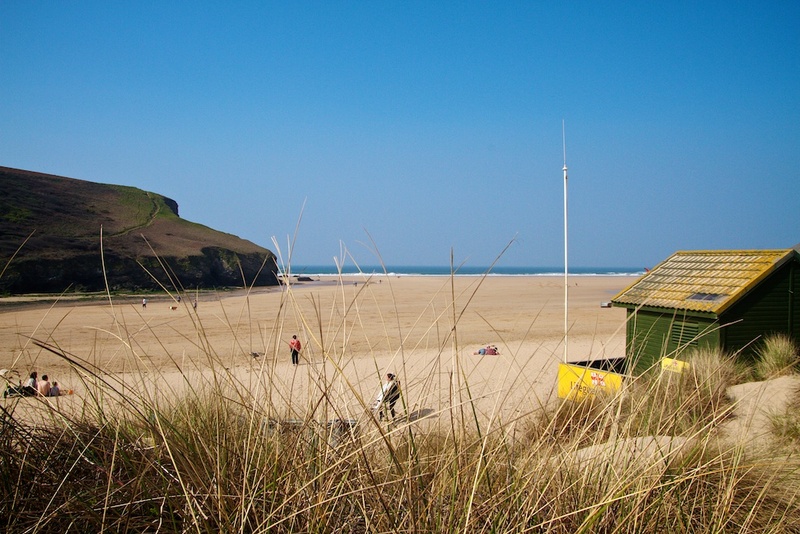 Mawgan Porth itself offers a choice of activities, including a surf school on the beach. 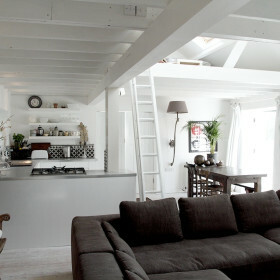 The kitchen is modern with all appliances, gas hob, electric oven. A separate utility room holds additional fridge and freezer space, washer, dryer and a small office space . All the doors open onto the deck, sun loungers, a bench, an eating area with tables and chairs, sun umbrella and large bar-b-q area. The house is south facing and tucked neatly out of the wind. The higher garden area is large enough to enjoy beach volleyball or football in the sand. 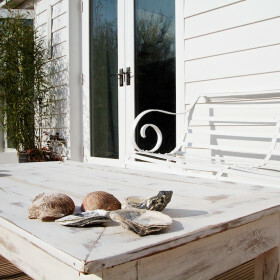 It also features a step accessed “lookout” with great views of the sea and sunsets. Guests have access through a private gate leading on to the beach. 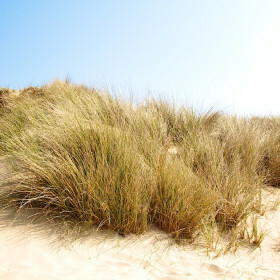 The Dunes can sleep up to six people. 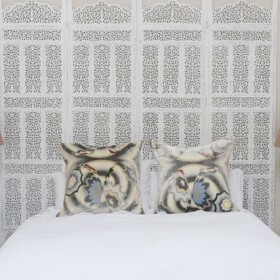 All rooms are bright and airy with crisp, Egyptian cotton linen, towels and handmade soap. 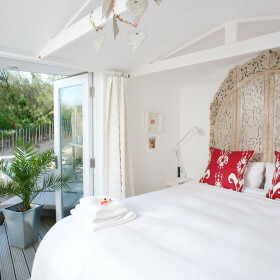 The main bedroom has a king size (5ft) bed, high apex ceiling with a large skylight window, ensuite shower room and walk-in dressing room, the bedroom has french windows that open onto the deck. 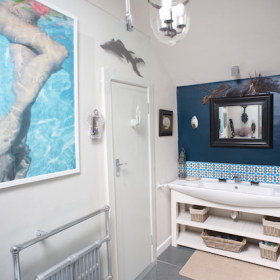 The second bedroom is a very private double at the other end of the house with ensuite bathroom including a large walk in ensuite shower room. All the windows from this bedroom open onto the deck where there is a roll top bath. 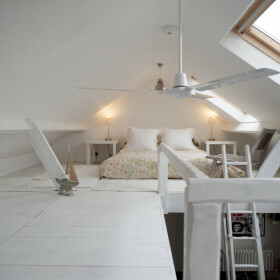 The loft sleeping area sleeps 2, is open plan and accessed by a ladder directly from the living area. The ceiling does not allow for an adult to stand fully upright. Please note, not recommended for very small children. 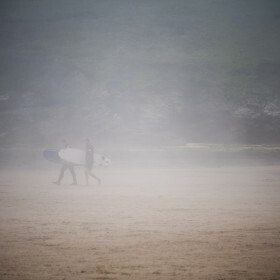 Build sand castles, hunt in rock pools, learn to surf. Unwind in the spa at the Scarlet. 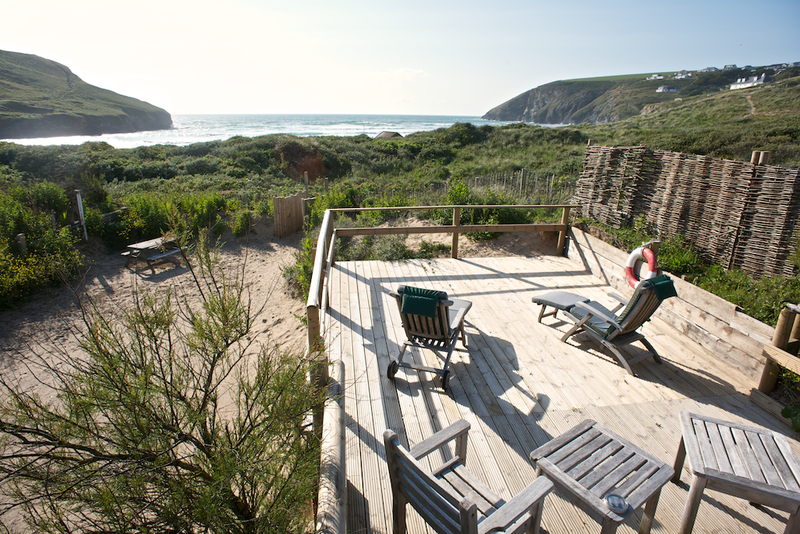 Celebrate your visit to Mawgan Porth, one of Britain's-best beaches, by popping a cork as the sun goes down.